The residences benefits from its address within the award-winning Laguna Phuket - Asia's favorite integrated resort complex on the island's stunning sunset coast - featuring hight-end hotels, an award-winning championship golf course, spas, bars and restaurants and a choice of exclusive leisure options. Contemporary in style, and overlooking nature’s best, the Angsana Oceanview Residences is infused with a blend of modern and traditional Thai elements that draw inspiration from the history and culture of the tropical island location. Each Angsana Oceanview Residence is designed with spacious living areas, comfortable bedrooms with ensuite bathrooms, and opens onto an al fresco deck and private infinity pool. 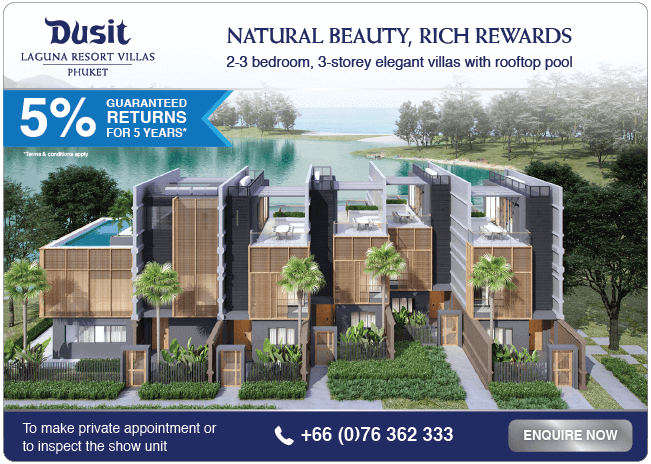 Angsana Oceanview Residences are integrated into a proven rental programme that allows owners to maximize their returns by having their apartment professionally managed by Angsana Laguna Phuket. As well as a rental return generated from their apartments, owners can also enjoy complimentary use of up to 60 days per year, adding a significant lifestyle return on the overall investment. Plus you are entitled to experience the Angsana Vacation Club that allows owners to sojourn in breathtaking locations including Morocco, Laos and Vietnam. Locations * Select location Thailand - Phuket Vietnam - Lăng Cô This field is required. The purpose of this document (“Data Protection Policy”) is to inform you of how Banyan Tree Holdings Limited and its related corporations (collectively, the “Companies”) manages Personal Data (as defined below) which is subject to the Singapore Personal Data Protection Act (No. 26 of 2012) (“the Act”). Please take a moment to read this Data Protection Policy so that you know and understand the purposes for which we collect, use and disclose your Personal Data. By interacting with us, submitting information to us, or signing up for any products and services offered by us, you agree and consent to the Companies, as well as their respective representatives and/or agents (“Representatives”) (the Companies and Representatives collectively referred to herein as “LBTL”, “us”, “we” or “our”) collecting, using, disclosing and sharing amongst themselves your Personal Data, and disclosing such Personal Data to the Companies’ authorised service providers and relevant third parties in the manner set forth in this Data Protection Policy. This Data Protection Policy supplements but does not supersede nor replace any other consents you may have previously provided to LBTL in respect of your Personal Data, and your consents herein are additional to any rights which to any of the Companies may have at law to collect, use or disclose your Personal Data. LBTL may from time to time update this Data Protection Policy to ensure that this Data Protection Policy is consistent with our future developments, industry trends and/or any changes in legal or regulatory requirements. Subject to your rights at law, you agree to be bound by the prevailing terms of the Data Protection Policy as updated from time to time on our website http://www.angsanaresidences.com/#privacy-policy. Please check back regularly for updated information on the handling of your Personal Data. b. Visit us at http://www.angsanaresidences.com/#privacy-policy. for more information.